Pixar is one of the best animation studios in the world, putting out a ridiculous amount of high quality movies over the past 20 years. But which of their many great movies is best? We rounded up the critic and user scores from Rotten Tomatoes, IMDB and Metacritic and worked out an overall average to find out! Not seen some of the movies in this post? Buy them now at amazing prices in the musicMagpie Store’s brilliant Pixar promotion! Poor old Cars 2 sits at the bottom of the pile with a measly-but-actually-not-that-bad 53.4%, even though it stars Michael Caine as a British spy car. What more do you people want?! Pixar’s latest is currently their second-worst, with critics praising the animation but finding some faults with the story. It’s still got mainly good reviews though, which shows that ‘not as good’ in the context of Pixar means ‘still better than most other stuff’. Brave had two things going against it from the start: the historical setting and a distinct lack of cute characters. We reckon it’s the hidden gem in the Pixar canon though. If you were a Pixar hipster, this is the film you’d like most. Under the mountain of merchandise shifted off the back of it, it’s easy to forget that Lightning McQueen’s first adventure is actually very, very good. Again: ‘not as good’ by Pixar standards is still better than pretty much every other animation. It was always going to be hard following a movie as good as Monsters Inc, so Pixar made a prequel instead. It doesn’t hit the heights of the original, missing the relationship between big scary monster and cute little girl, but it’s still pretty good. Pixar’s second film is a bit of a forgotten classic, overshadowed by the popularity of Toy Story 2 and Monsters Inc a few years later. It’s well worth checking out again though, if only for the Heimlich the jolly caterpillar. Years before The Avengers, The Incredibles were cinema’s greatest superhero team. You get the feeling if it was released today, when superheroes dominate the box office, it’d probably be the biggest film ever. Perhaps the upcoming sequel will be. Only Pixar could turn a movie about monsters harvesting the screams of children for energy into a heart-warming comedy. Bring tissues for the end though: you’ll need them unless you have a heart of stone. Fresh from successfully moving to Andy’s new house, Woody and co end up facing a new threat: a crazed toy collector. Toy Story 2 isn’t quite as good as the first, but it’s still a lovely film about friendship and family. It also has the best scene of someone crossing the road with a traffic cone on their head this side of a CCTV camera on a Saturday night. The best film about fish, ever (take that, Jaws). The journey to find Nemo is so fun, with so many great characters, that you’d be forgiven for forgetting what Marlin and Dory are looking for halfway through, or at least hoping they leave the little fella in that fishtank for a little bit longer. If your children ever decide to let a rat run riot around your kitchen, this is the movie to blame. Seriously kids, they can’t really cook! But do pursue your dreams, and don’t let snooty critics/public health officials stop you. Up is a brilliant film, even if it did take us 4 or 5 watches to make it through the first 10 minutes without drowning in a pool of our own tears. SQUIRREL! It’s a tale as old as time: rubbish-sorting robot meets futuristic flying robot, rubbish-sorting robot loves futuristic flying robot, rubbish-sorting robot is forced to save humanity from impending doom. The first 40 or so minutes are jaw-droppingly good too. AKA the film that made millions of young adults burst into tears and run home to play with their Action Men immediately. Oh…just me? Released 11 years after the first sequel, Toy Story 3 introduced a whole new generation to the adventures of Buzz and Woody. 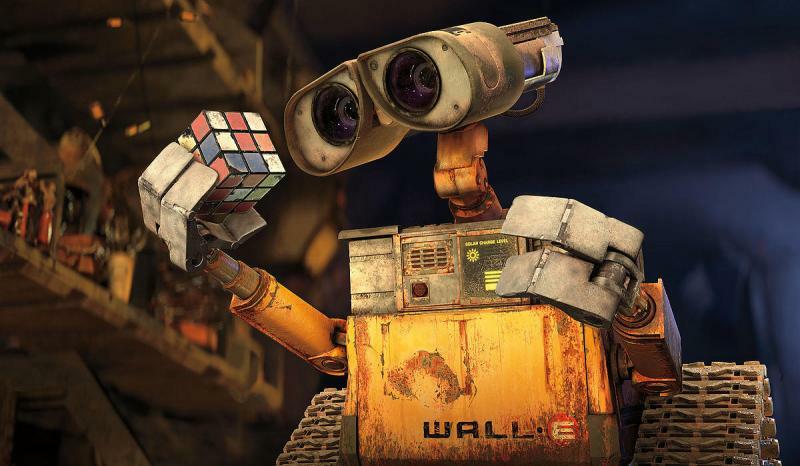 One of Pixar’s most recent films demonstrates that they very much still have it. Inside Out, which takes place inside a little girl’s head and features emotions as the main characters, is smart, funny and – noticing a pattern here? – will probably make you blub like a baby by the end. The original and the best. For all the advances in technology and high concept stories, the simple story of a toy cowboy and a delusional toy spacemen escaping the clutches of a toy-killing psychopath with the power of friendship remains Pixar’s best picture. What is your favourite Pixar movie? Let us know in the comments! Don’t miss out on cheap Pixar DVDs in our amazing promotion either. ← Which Star Wars movie is the best?